Figure 15. Mapping of a functional complex on a simplified cladogram of mammal relationships. This functional complex for thin-branch arboreal locomotion and foraging (gray rectangle) includes all the following characteristics: (1) the presence of more prehensile hands and feet, (2) predominant use of diagonal-sequence walking gaits, (3) more protracted arm position at forelimb touchdown, and (4) relatively lower Vpk forces during quadrupedal walking. The presence of this functional complex has been documented only in woolly opossums and primates, which strongly argues in favor of convergent evolution of these traits for the need of moving and foraging on thin branches in distantly related groups. 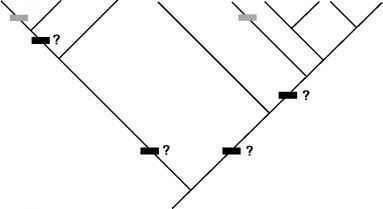 Nonetheless, the presence or absence of this complex in the last common ancestor of the opossums, marsupials, eutherians, and tree shrews/primates is still equivocal (black rectangles with question marks). The relationships for the opossums are based on work by Kirsch et al. (1997) and Jansa and Voss (2000) (Ca: Caluromys; Di: Didelphis; Ma: Marmosa; Mo: Monodelphis; Ph: Philander). We chose tree shrews as the sister taxon of primates based on the work of Sargis (2002b, this volume). 2002, 2003; Ji et al., 2002; Szalay and Sargis, 2001). Behaviors practiced by these early mammals probably involved locomotion and foraging on all kinds of arboreal substrates. In this way, these primitive mammals were already adapted for movements on "uneven, disordered substrates" (Jenkins, 1974: 112). A versatile locomotor repertoire in an animal of the size of a tree shrew or smaller, is just as beneficial in both "arboreal" and "terrestrial" environments as pointed by Jenkins (1974). One can envision such small, generalized arborealist restricted to an environment in which vines or terminal branches are predominant evolving the kind of grasping and locomotor specializations seen in both woolly opossums and primates. 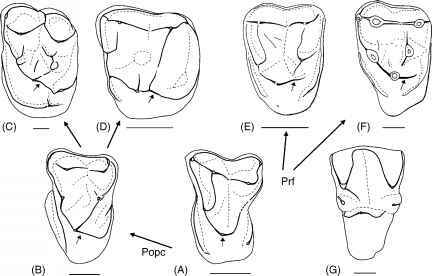 It is probably from this initial restriction to a fine-branch niche in the earliest primate ancestors that the order rapidly diversified and various locomotor specializations seen in primates today evolved.